The author of the winning research is Prof Faaizah Binti Shahsudin from Universiti Teknikal Malaysia Melaka, Malaysia. The winner of the SEAMEO-Jasper Research Award 2018/2019 will receive the Plaque of Recognition at the Awarding Ceremony of the 50th SEAMEO Council Conference to be held in 2019 in Malaysia. Details are soon to be confirmed. High appreciation is extended to all researchers who participated in the 2018/2019 SEAMEO-Jasper Research Award. Appreciation is also extended to the Ministries of Education of Southeast Asian countries, SEAMEO Regional Centres and SEAMEO partners for their assistance in the promotion and information dissemination of the 2018/2019 SEAMEO-Jasper Research Award. SEAMEO Secretariat extends gratitude to the unceasing support of the Government of Canada for the SEAMEO-Jasper Research Award. The author of the winning research is Mr Amando Perfecto Dela Cruz Molin, PhD candidate at the University of the Philippines Diliman, the Philippines. The winner of the SEAMEO-Jasper Research Award 2015 will receive the Plaque of Recognition at the Awarding Ceremony in the Strategic Dialogue of Education Ministers to be held in April 2016. Details are soon to be confirmed. High appreciation is extended to all researchers who participated in the 2015 SEAMEO-Jasper Research Award. Appreciation is also extended to the Ministries of Education of Southeast Asian countries, SEAMEO Regional Centres and SEAMEO partners for their assistance in the promotion and information dissemination of the 2015 SEAMEO-Jasper Research Award. The SEAMEO Secretariat wishes to inform all that the Selection Committee for the 2014 SEAMEO-Jasper Research Award decided not to select a winning research entry for this year. Several factors contribute to this decision, one of which is non-responsiveness of submitted research entries to this year’s theme “Accelerating Regional Mobility through Education, Science and Culture”. Given the dearth of research studies along this theme, SEAMEO intends to enhance its efforts in developing and promoting activities geared towards increasing intra and inter-regional mobility in Southeast Asia. High appreciation is extended to all researchers who participated in the 2014 SEAMEO-Jasper Research Award. Appreciation is also extended to the Ministries of Education of Southeast Asia countries, SEAMEO Regional Centres and SEAMEO partners for their assistance in the promotion of the Award. SEAMEO extends gratitude to the cooperation and support of the Government of Canada to the SEAMEO-Jasper Research Award. The next cycle of SEAMEO-Jasper Research Award starts in May to September 2015. The theme for 2015 SEAMEO-Jasper Research Award will be announced in May 2015. 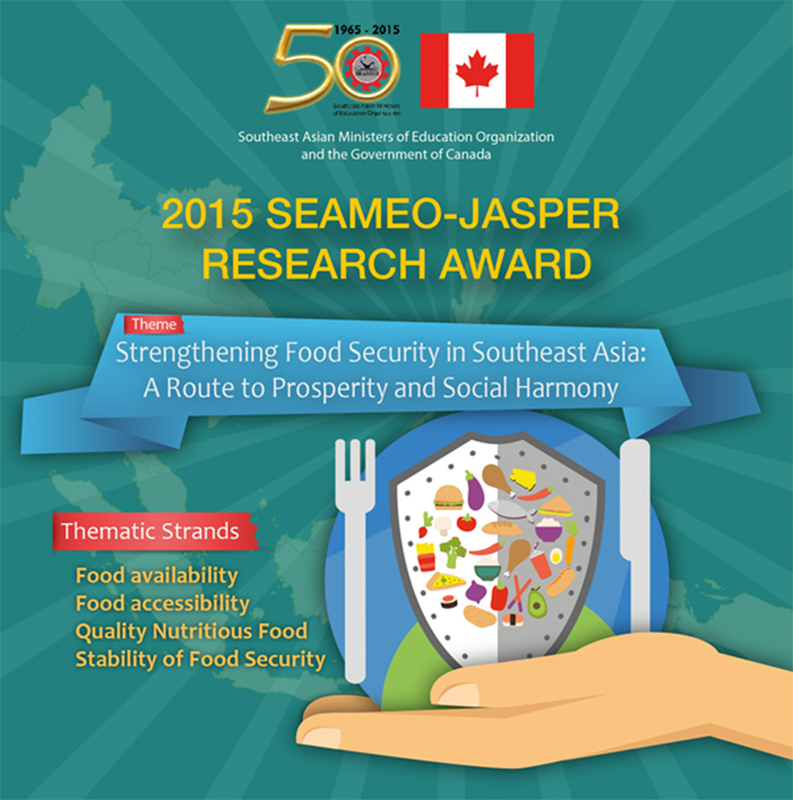 The SEAMEO-Jasper Research Award was established in 1990 with the support of the Government of Canada as a way of recognizing exemplary research conducted by Southeast Asian nationals in the region. The yearly award aims to encourage young scholars to conduct researches on a relevant theme on social development in Southeast Asia and to facilitate continued interaction and knowledge-sharing among Southeast Asian and Canadian researchers. 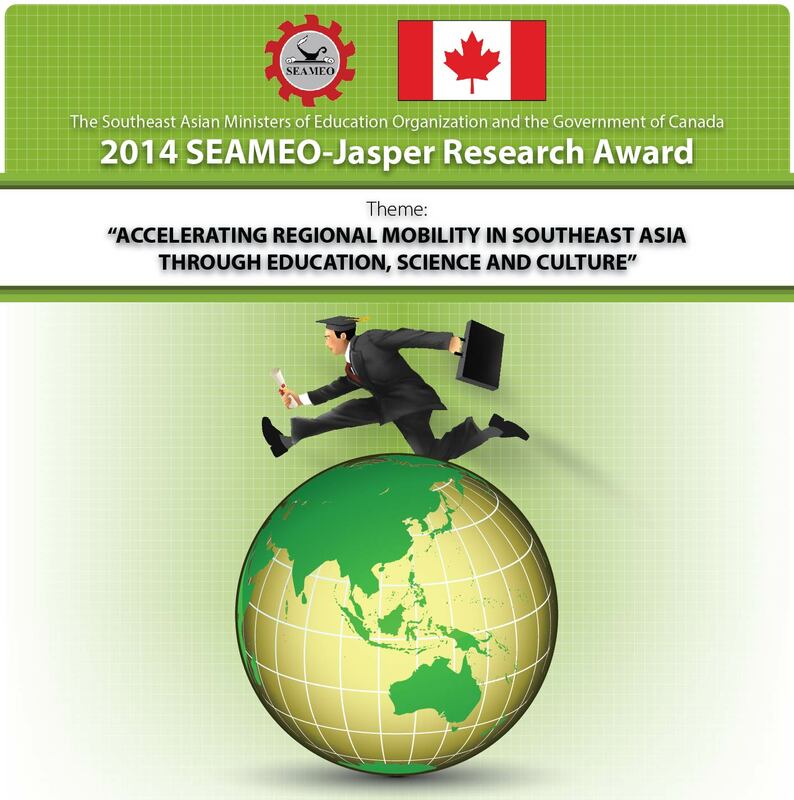 The theme for 2014 SEAMEO-Jasper Research Award is Accelerating Southeast Asian Regional Mobility through Education, Science and Culture. The Southeast Asia aims to integrate the whole region by 2015 into the ‘ASEAN Community’, with easier and free movement of goods, services, investment, labor, and capitals. Regional mobility and employment are, at present, high priorities of Southeast Asian countries. The region’s goal of regional integration drives the Southeast Asian countries to introduce education reforms, launch scientific innovations and promote cultural development. Crossing geographic, cultural, digital, and educational and occupational borders in the pursuit of an international education and employment is a current trend globally and regionally. In Southeast Asia, regional mobility is seen as a vehicle that would carry forward and importantly, sustain continued regional integration way beyond 2015. The 2014 SEAMEO-Jasper Research Award theme aims to draw attention to the role of education, science and culture in accelerating the goals of regional mobility through facilitating knowledge flows, education and labor mobility and cultural exchanges in the region. This year’s SEAMEO-Jasper Research Award recognizes research studies that investigate how education, science and culture interplay closely with regional mobility. The Award distinguishes studies that explore concepts, traditional or innovative models and best practices on academic and research links between universities, student and professional mobility and cultural exchanges in Southeast Asia. Likewise, research studies may include investigations or documented cases on government and university policies and practical strategies on mobility of cultural professionals and scientific talents. This thematic strand focuses on studies on trends in regional and international student mobility and factors affecting inbound or outbound student flows in Asia. This strand includes explorations on the implications of student mobility and the interplay between national government policies, university policies and students’ individual preferences and motivations on studying abroad. 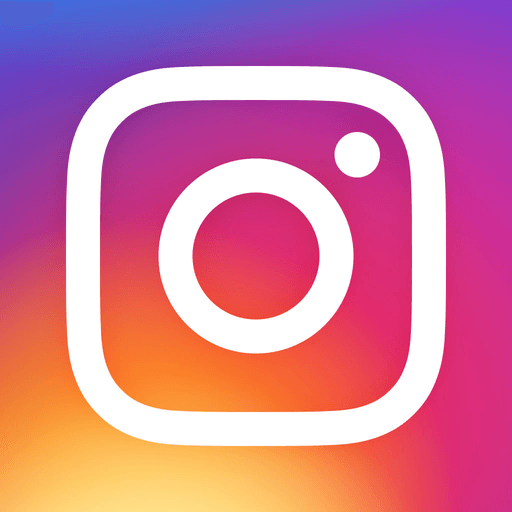 The strand likewise distinguishes research studies on how universities and education institutions are transforming in response to increasing global interconnectedness and higher demand to develop global graduates. Studies on the many forms of internationalization of education such as co-taught courses, international partnerships, online open courses, collaborative research projects and others are included in this sub-topic or topic. This thematic strand pertains to research studies that investigate the reasons and motivations behind professional mobility and migratory moves of talented and highly-specialized professionals from one country to another. This strand underscores explorations on the effects of professional mobility to both the country of origin and the host country; and how such mobility implies to the concept of one’s citizenship and nationalism. This thematic strand focuses on investigations on models of cultural exchanges and trends on mobility of artistic and creative talents and cultural professionals beyond national and regional borders. This strand includes studies on how cultural mobility promotes cultural and linguistic diversity, fosters intercultural dialogue and facilitates movement of cultural goods and services. Researches on government or university policies, support programmes and schemes for cultural mobility also fall under this strand. Physically fit to travel; certification by a competent physician may be requested before travelling. * SEAMEO Member Countries: Brunei Darussalam, Cambodia, Indonesia, Lao PDR, Malaysia, Myanmar, Philippines, Singapore, Thailand, Timor Leste, and Vietnam. Non-winning research entries may be selected to be featured in SEAMEO’s Southeast Asian Journal of Education, subject to permission/approval from the author. A Selection Committee composed of representatives from relevant international organizations, experts in the field covered by the theme and officials of SEAMEO will be convened to review the submitted entries. Selection will be based on the quality of the research, its relevance to the theme, to improving education in Southeast Asia and its potentials for promoting better understanding between Canada and Southeast Asia. The winner of the SEAMEO-Jasper Research Award will be awarded a Plaque of Recognition at the 37th SEAMEO High Officials Meeting in Bangkok, Thailand in November 2014. The SEAMEO-Jasper Research Award winner will receive a travel fellowship to Canada or to any two (2) of the SEAMEO Member Countries to disseminate the results of winning research to relevant education/research institutions. The fellowship includes 8-day all expense paid travel to Canada/Southeast Asian countries (inclusive of travel time). The fellowship will include assistance by the SEAMEO Secretariat in travel and meeting arrangements. The fellowship visit shall be done within twelve months from the date of the awarding. Hard copy and electronic submissions must reach the SEAMEO Secretariat on or before 30 September 2014. “Does Post-Migration Education Improve Labour Market Performance? : Findings from Four Cities in Indonesia”. The author of the winning research is Dr Devanto Shasta Pratomo, Lecturer and Researcher at the Faculty of Economics and Business, Brawijaya University, Indonesia. The winner of the SEAMEO-Jasper Research Award 2013 will receive the Plaque of Recognition at the Awarding Ceremony in the 36th SEAMEO High Officials Meeting to be held in 18-20 February 2014 in Bangkok, Thailand. High appreciation is extended to all researchers who participated in the 2013 SEAMEO-Jasper Research Award. Appreciation is also extended to the Ministries of Education of Southeast Asian countries, SEAMEO Regional Centres and SEAMEO partners for their assistance in the promotion and information dissemination of the 2013 SEAMEO-Jasper Research Award. The theme for 2013 SEAMEO-Jasper Research Award is Education and Employability. This year’s theme aims to raise the importance of placing employability at the core of the national and regional strategies of the Southeast Asian region, preparing students for sustainable labor market and enabling them to be better prepared for an increasingly competitive regional economic environment. The 2013 SEAMEO-Jasper Research Award recognizes studies or investigation on the dynamics and interplay of education and employability in Southeast Asia and the myriad issues related to efforts of different sectors to increase the region’s competitiveness through improving employability skills of graduates. Enhancing graduates’ employability is a cross-cutting regional concern; becoming even more timely as Southeast Asia works on its way to becoming an integrated economic community by 2015 (ASEAN Community). A number of contentious arguments could be raised on the issue of putting employability as the primary basis for shaping the directions and policies of education systems, there is no doubt though that education predicts employability. The task of producing graduates does not rely solely on higher education but on the education system as a whole. With the onset of greater integration by 2015, the education system will be faced with the greater challenge of producing graduates who will not only be meeting the national industry requirements but who will be able to compete successfully at the regional level. With this year’s research theme of Education and Employability, SEAMEO and the Government of Canada hope to highlight the importance of graduate employability and the concerted efforts needed by all sectors to adequately prepare students to meet the challenges of a new economically integrated Southeast Asia. This thematic strand focus on the significant roles of higher education in producing employable graduates and the challenges of adapting the higher education system to labor or industry needs. This track includes studies that explore higher education efforts to determine pedagogical approaches that would facilitate students’ better transition from an education based on knowledge to an education fostering independency and development of skills required by the labor market. Further, this track explores how higher education institutions are gearing their policies towards improving students and professional mobility in the region. This thematic strand responds to research studies that investigate the variety of strategies education institutions and business organizations could collaboratively undertake to improve the employability of higher education graduates. This research track focuses on partnerships between the education institutions/universities and job providers to meet the labor market’s long-term requirements, and how these initiatives have contributed to efforts exerted by national governments to enhance the conditions of employability. This thematic strand pertains to research studies that investigate the state of science and technology manpower development in the region and the variety of strategies national governments, education institutions and industries are taking to upgrade the science and technology competencies of Southeast Asian peoples to enhance the region’s human resource competitiveness. This thematic strand focuses on traditional and innovative models on developing, sustaining and scaling up of entrepreneurial skills among students, graduates and non-graduates not only for the purpose of generating income but more so to create next-generation jobs and fresh innovations. This strand also explores government and TVET institutions’ policies and strategies to improving employability skills of students. This thematic strand draws out studies that look into culture-related factors that have implications to employability of graduates from the region such as ethnicity, language, traditional management or leadership practices that have been known to affect recruitment process, work culture and others. 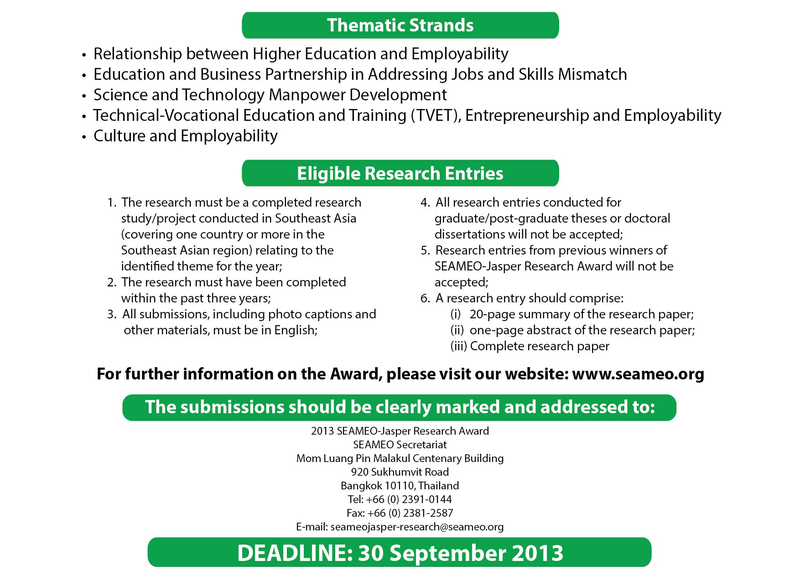 Winning and non-winning research entries may be selected to be featured in SEAMEO’s Southeast Asian Journal of Education, subject to permission/approval from the author. The winner of the SEAMEO-Jasper Research Award will be awarded a Plaque of Recognition at the 36th SEAMEO High Officials Meeting in Bangkok, Thailand in November 2013. Hard copy and electronic submissions must reach the SEAMEO Secretariat on or before 30 September 2013.